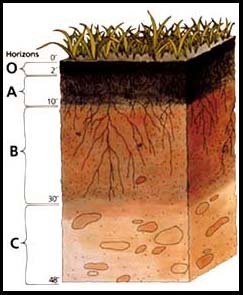 A typical soil profile consists of layers, called horizons, that result from the interplay of climate, organisms, relief or topography, the composition of the parent material, and age. Most soils have four horizons: an organic horizon (O) at the top (the duff layer), consisting of mostly organic material in various stages of decomposition, a C horizon at the bottom, consisting of partially weathered bedrock and little or no organic material; and the transitional A and B horizons between them. In same cases, the A horizon is replaced by an E horizon. The USDA soil classification recognizes 12 soil orders based on differences in soil forming processes and horizon characteristics. According to this classification, Sylvania’s soil is a Spodosol, which is an infertile soil that forms under forests in humid climates, especially in cold high latitude locations. Soils in Sylvania have formed from the glacial drift which has a mineral composition resembling that of the bedrock at the base of the soil profile. This material is mostly igneous and metamorphic Precambrian rock which resists weathering. The soils derived from such parent material are, therefore, mostly a coarse loam, consisting of sand and silt, with little clay (the smallest of the three particle sizes). The relatively large pore spaces in such a coarse-textured soil permit water to move through it relatively easily. However, landforms composed of this parent material differ somewhat in their soil texture, depending on how the soil was deposited. For instance, water drains more quickly from a sandy outwash plain than from unsorted till that contains finer material. very poorly drained organic soils with 0-2% slope (Carbondale and Greenwood series). Climate affects soil formation through the effects of soil moisture and temperature. Sylvania’s cold climate is responsible for the slow rate of decomposition of the organic material on the forest floor. It is also responsible for the relatively small rate of evapotranspiration. Consequently, considerably more precipitation enters the soil and moves through it than is lost through evaporation from the soil or transpiration from plants. Living organisms are important factors of soil formation. The soils of the Sylvania Wilderness Area bear the chemical and physical imprint of temperate forest vegetation which takes up nutrients from the soil and returns it in the form of organic material on the forest floor. Organic material in general, but especially pine needles and the leaves of certain deciduous trees such as birch, break down in the presence of water to form a weak organic acid. The acidic soil water reacts with some of the organic and mineral components of the soil to mobilize important plant nutrients such as calcium, magnesium, and potassium, as well as iron (causing them to form complexes that are water soluble). It can also mobilize or dislodge clay particles. These soil constituents are removed from the upper portion of the soil column and deposited in the lower portion (translocated) by the soil water moving downward. If the nutrients removed from the upper horizon are not replaced by the addition of nutrients through the decomposition of organic matter at the forest floor, the horizon becomes devoid of nutrients (leached), referred to as acidic, and is infertile. The replacement of nutrients and the degree of translocation is a function of the soil forming factors. The dominant soils (54% of the land area) are the Gogebic and Wabeno series (Bockheim and Jordan 2004). At the top of these soils are Spodosols which are characterized by such extreme leaching that the top horizon is ashy-grey and is referred to as an “E” (eluviated or leached) horizon. 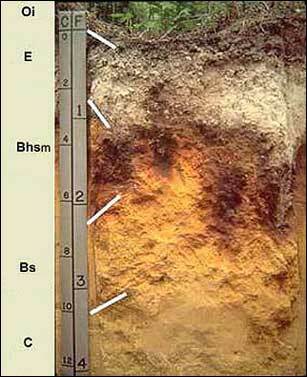 These soils are therefore highly acidic (pH 4.8) and very infertile (less than 20% base saturation). The extreme leaching is due to a combination of factors, most importantly the large amount of water entering the soil (particularly during spring snow melt and heavy rainstorms), the coarseness of the soil facilitating the downward movement of water, and the slow decomposition of the organic material. The deposition of iron in the lower (B) horizon gives it a reddish brown color. The lower portion of the B horizon contains more clay and nutrients than the E horizon but is still acidic (pH 5.3, 45% base saturation). Furthermore, a hardpan (fragipan) above it restricts drainage and limits root depth to about 17 inches (43 cm). The soil for another 11% of the area belongs to the Padus series. It is similar to the Gogebic and Wabeno series but does not contain a hardpan. About 10% has an organic soil which is deep, poorly drained, and supports a forest dominated by swampy conifers. Another 5% belongs to the sandy Pence, Rubicon, and Vilas series which are only weakly developed Spodosols (most likely because soil water moves through them too quickly for the reactions needed to mobilize the nutrients). About 19% of the area is water.